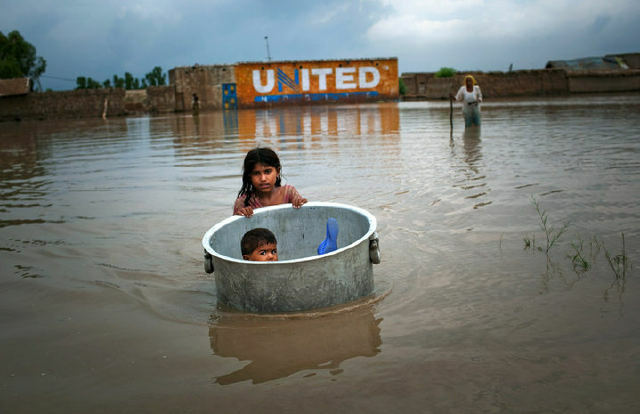 ISLAMABAD: The top political leadership of the country joined hands on Saturday to cope with the worst ever floods in the country and agreed on setting up a body to raise funds for the rehabilitation of flood victims. Prime Minister Syed Yousuf Raza Gilani and Pakistam Muslim League-N (PML-N) chief Nawaz Sharif, while addressing a joint press conference after a meeting here at the PM House, expressed deep shock and grief over the wide scale devastation that displaced around 20 million people and caused losses of billions. The two leaders expressed the resolve to work together for the rehabilitation of the flood-affected people. Prime Minister Gilani said he also telephoned Asfandyar Wali of Awami National Party (ANP) and would continue to contact other leaders to gain their support for a national cause. "The calamity demands of us that all political parties rise above their differences to jointly cope with the disaster," Gilani said. He said the government has decided to set up a body to transparently collect and disburse the funds amongst the provinces judiciously, as per the damage assessment. The prime minister said the members and details of the new body would be announced in a few days and would have the credibility and trust of the entire nation. Gilani said the members of the new body have not yet been finalized, but amongst those on the list could be Rana Baghwan Das, Fakharuddin G Ibrahim, Justice Nasir Aslam Zahid etc. A very well writtes sir.